The pyramid of Kukulcan, also known as El Castillo, is one of the most impressive constructions at the Maya site of Chichen Itza. Some consider its innate calendrical significance to be expressed in the numerology of its four stairways, one on each side, each of which rises in ninety-one steps to the top platform; adding the final step into the temple on the top makes 365 steps in all. 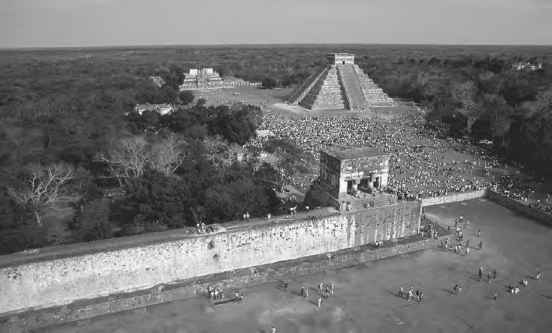 The pyramid is not cardinally oriented but skewed by about twenty-one degrees clockwise, and archaeoastronomers have investigated the possible reasons for this as part of systematic studies of the orientations of Maya temples and city plans. 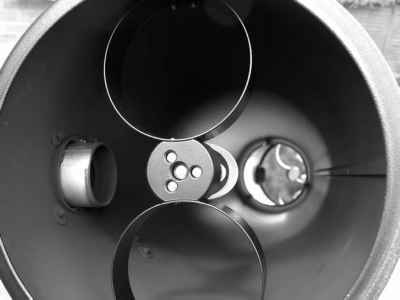 However, the phenomenon that has captured the public imagination was apparently discovered by chance by a caretaker at the site in the late 1920s. 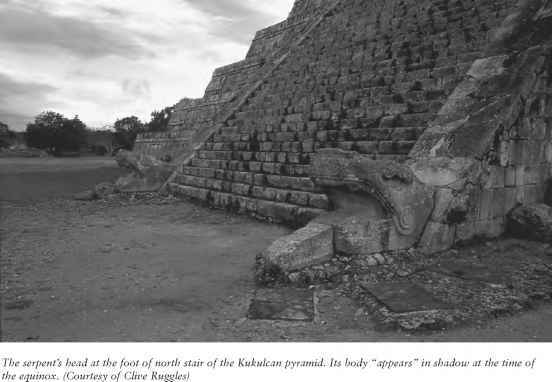 Twice each year, at around the time of the equinoxes, the late afternoon sun slants across the stepped terraces of the northwestern (actually NNW) corner of the pyramid and casts a sinuous shadow onto one balustrade of the northern (actually NNE) staircase. At the bottom of this balustrade is a large stone serpent's head, and the shadow appears to complete the body of the serpent, undulating back up the balustrade. The shadow is visible for an hour or two, as sunset approaches. the pyramid does overlay an earlier version, and this one only had a single stairway which was on the northern (actually NNE) side. Furthermore, there is good evidence to relate the pyramid to Kukulcan, a plumed serpent (feathered rattlesnake) god prominent in the Mesoamerican pantheon, known later to the Aztecs as Quetzalcoatl. There is also good evidence to relate Quetzalcoatl to the planet Venus. A platform to the north of the Kukulcan pyramid has wall carvings containing a number of Venus symbols, and as a result has become known as the Platform of Venus. This has led some to suggest that the timing of the so-called equinox hierophany may have had more to do with the motions of Venus than the equinox. Be this as it may, the site has certainly become the focus for modern pilgrimage. The hierophany is now witnessed by tens of thousands of visitors, which has become interesting as a modern sociological phenomenon in itself. Caracol at Chichen Itza; Venus in Mesoamerica. Aveni, Anthony F. Skywatchers, 298-300. Austin: University of Texas Press, 2001. Shadow' Phenomenon at the Castillo, Chichén Itzá, Yucatán." Archaeoas-tronomy: The Journal of Astronomy in Culture, 14 (1) (1999), 136-152. Krupp, Edwin C. Echoes of the Ancient Skies, 298-299. Oxford: Oxford University Press, 1983. 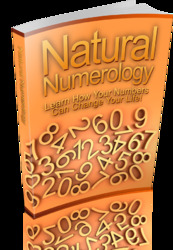 Be Enchanted By The Power Of Numbers And How It Tells You About Your Life. This Book Is One Of The Most Valuable Resources In The World When It Comes To change lives.